Spring is on its way, and Bill Jacobs BMW of Naperville is excited to announce the arrival of the all-new 2014 BMW 4-Series Convertible, now available in their showroom. 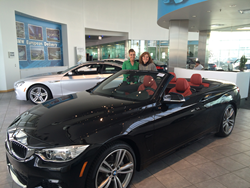 Spring is on its way, and Bill Jacobs BMW of Naperville is excited to announce the arrival of the all-new 2014 BMW 4-Series Convertible, on display in their showroom. Based on the 4-Series coupe, this comfortable and elegant Ultimate Driving Machine is now available without a roof. The introduction of the BMW 4-series convertible at Bill Jacobs BMW means that customers can own a BMW convertible with all-wheel drive for the first time. The BMW 4-series convertible replaces the BMW 3-series convertible, and features a three piece insulated retractable hardtop. The hardtop has been improved to maximize cargo capacity, and can now be rotated out of the way for better access to the trunk. When raised, the new hardtop on the 4-series convertible helps to dramatically reduce interior noise, making for an enjoyable quiet cruise. The new and improved design of the BMW 4-series convertible is longer, and slightly wider than the 3-series, with a chassis that is lower to the ground. The front-seat seatbelts have been built into the seatbacks, which eliminates the typical seatbelt-flapping experience common in other convertible models. The BMW 4-series convertible offers more passenger headroom and legroom than the 3-series model, making it the perfect choice for a modern luxury vehicle. This magnificent chariot also offers advanced climate control features like neck warmers and heated seats, as well as a removable wind blocks behind the front seats. These features are sure to leave drivers and passengers comfortable, and anything but wind-blown. With the introduction of the new 4-series convertible, BMW gave considerable attention not only to the look and feel of this luxury vehicle, but also to its all-season utility. Under the hood, BMW's popular 3.0-liter inline six-cylinder engine comes standard in the 435i, along with an eight-speed automatic transmission. The new BMW 4-series convertible hosts significant fuel-saving features. The Eco Pro mode allows for maximum fuel efficiency. The BMW 4-series convertible also incorporates an auto stop-start feature, which turns the engine off at stoplights.